Frugality is a dirty word to so many people. Oftentimes, the lifestyle is associated with being a cheapskate or a Scrooge. These associations always make me cringe, especially when I hear people associate frugality with deprivation. Living a frugal life is not about deprivation for those who do it right, and it never has to be about being a cheapskate. Anyone who has learned to live frugally (the fulfilling way) will tell you being wise with your money only enhances your life. It doesn’t deprive you of all of your favorite things. Although some people may choose to live a life of deprivation for whatever reason, frugality isn’t about deprivation. You can absolutely live a frugal life without depriving yourself of the things that bring you joy. Here’s how to do it! The best way to jump-start a frugal lifestyle is to decide what’s important to you and allocate part of your budget to those areas. This is otherwise known as value based spending. Initially, it can be hard to figure out what makes you the happiest. The hard part, for me, was shopping. I used to get a high when I went shopping to buy new stuff, especially at Target, and that made me think shopping made me happy. The problem was the high I was experiencing was fleeting and often completely gone by the time I unpacked my shopping bags at home. It was definitely gone by the time I was hauling my stuff down to Goodwill to donate it. I had to learn that shopping doesn’t ultimately bring me happiness like my other favorite hobbies — sewing, reading, and spending time with my family. Once I realized what actually made me happy, it was much easier to let my supposed love of shopping go. Frugality helps you budget your money to where it counts, which means you can live a full life without getting into debt. Learning to budget also helps you pay off any current debt you may already have – a step that brings you closer to financial freedom. Once you start allocating your money to where you want it to go, you can see what areas need to be cut. Maybe that means you finally realize you really want to pare down your unnecessary spending so that you can stay at home with your kids. Frugality gives you the chance to explore those options. Budgeting or tracking your spending will help you identify where you can cut back so you can reach your financial goals. Often times, you may not even feel the pinch if you simply cut out things that don’t make you happy. For example, if the reason you’re eating out so much is due to lack of planning, then simply starting a weekly meal plan and only going to the grocery store once per week can help you cut down on your restaurant tab. My favorite trick to use when I’m itching for a new do-dad is to think about how my grandparents lived when they were my age. In our grandparents’ generation, they didn’t really have a choice about being frugal. They were frugal because they had to be. It wasn’t that long ago when people weren’t surrounded by plastic tchotchkes stuffed into every corner of their houses. Shopping malls weren’t a thing yet, and if you wanted a new outfit, you had to sew it yourself or pay someone a fortune to do it for you. My Granny often tells the story about growing up in a house full of kids (her parents had 12), where she had to sleep in a bed with two of her sisters. The quilts they had for their bed didn’t cover the entire bed with the 3 of them in it, so extra blankets were a hot commodity. My favorite story of hers, though, is the year their older brother bought the girls their very first bicycle. They had to share it between the three of them, and they were tickled to death with it. Those stories are a far cry from how we live today, where our kids go to birthday parties with petting zoos and water slides, and each child must have their own bedroom in a 3,000 square foot house. Expectations have definitely changed in the last few decades, and thinking about how people used to live can help us gain some much-needed perspective. We are very spoiled with our ability to hop into our cars and run to the store for whatever strikes our fancy at a moment’s notice. There’s not much delayed gratification anymore. If you want it, you can go get it, and that can be a hard habit to break. Embracing the idea of delayed gratification is truly an art. It’s hard at first, but once you’re used to it, it becomes second nature. Before my husband became a frugal person, it used to drive him crazy when I would see something I wanted at an antique store and then walk away from it. He wanted me to have it right then and there, but I had learned that by walking away, I always gained perspective. Walking away allowed me to continue thinking about the object or forget it, and oftentimes I would forget about it. Sometimes I would go home and realize I had nowhere to put another new object, so I’d let it go. If I absolutely had to have something, I’d go back to buy it in a few days. Sometimes it would be gone and sometimes it would lose its luster by the time I saw it again, so I still wouldn’t buy it. Delayed gratification is a great tool to use. By learning to live with delayed gratification, you learn that things don’t make you happier and that we actually need far less than we think we do. Frugality lets you focus on more important things in life. When you stop worrying about paying so many bills, you gain clarity in your life and begin to focus on what’s actually important in your life. Maybe you have a baby crawling on the floor around you, a spouse that craves your attention, or a toddler about to start kindergarten. These are the things that need our focus right now rather than mindless shopping with a credit card at a mall. I’m only 30 years old, but the older I get, the more simplified I want my life to become. The simpler my life is, the happier I am, and I’ve reached a simple lifestyle because I began to embrace frugality a few years ago. Frugality is helping me live a better life because it has taught me how to save money, simplify, and be happy with what I already have. Have you embraced a frugal or simple lifestyle? What have you gained from it? 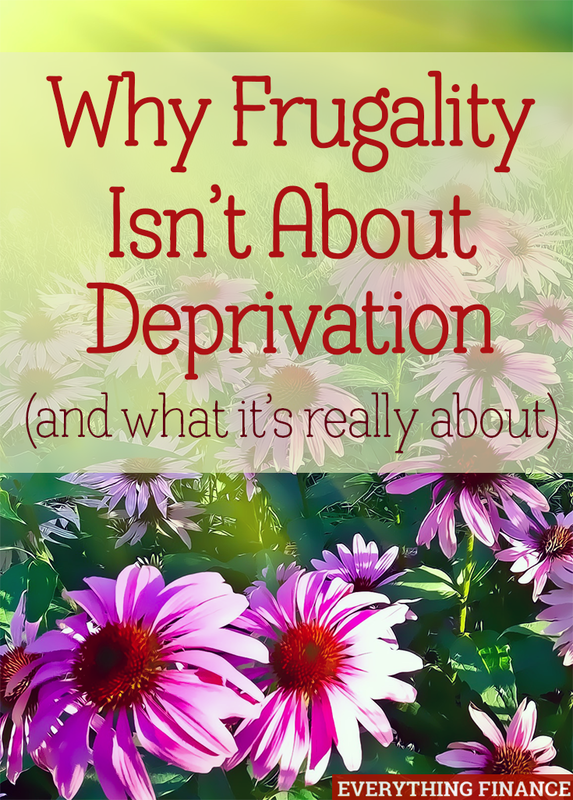 Do you or have you ever thought that frugality is about deprivation? What a fantastic post! I see so many people who spend money everywhere without ever defining the important areas of their life or what their priorities are. Delayed gratification is another area that is hard to teach. To some it sounds like one is being cheap or not ‘living’ because they are denying themselves items or experiences that excite them, but that is truly not the case. Delayed gratification is about keeping perspective and focusing on the values that are important. I would love to do everything in life, but not at the expense of not saving or investing in my future. I would rather pace myself through life. No point in wiping out my savings to go on that crazy European adventure that when delayed will bring more happiness in 5 years when I can afford it without thinking.